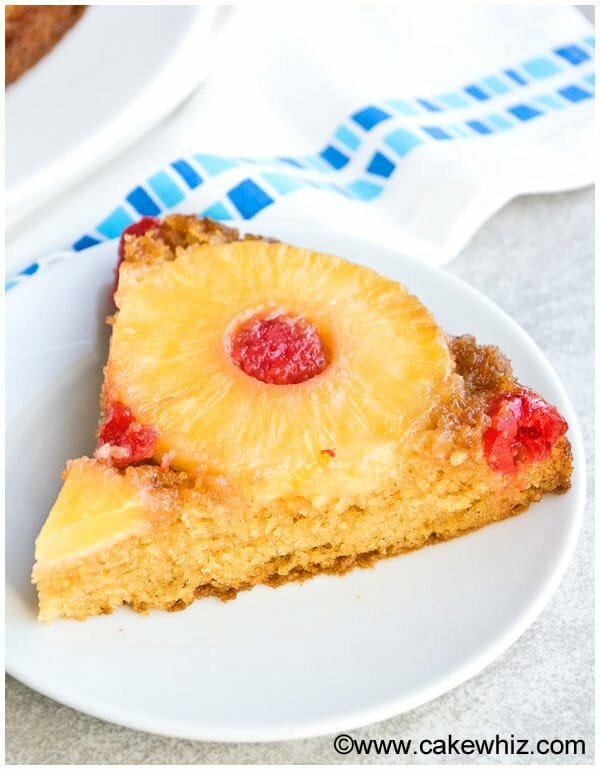 Quick and easy homemade pineapple upside down cake recipe rom scratch. It’s soft and moist with a golden caramelized top layer. Best classic cake ever! While BROWSING through my Mom’s old recipe book, I found her homemade pineapple upside down cake recipe, buried near the last few torn-up pages. Seriously, this pineapple upside down cake from scratch rocks my world and everyone begs for the recipe after just one bite! Honestly, I think that if I wasn’t such a BIG chocoholic, I would be making this cake ALL the time…lol. It’s SOFT and FRUITY with a beautiful beautiful CARAMELIZED golden syrup top layer! This is the perfect SUMMER cake and the best pineapple upside down cake without cake mix. Anyways, what makes this cake so great? Don’t be intimidated by the pineapple upside down cake ingredients. It may seem like a long list but they are simple ingredients that you already have in your kitchen pantry. I would not recommend using this recipe to make a pineapple upside down cake in bundt pan/pineapple upside down cake bundt. You need a different recipe for that. The buttermilk and yogurt are two KEY ingredients that make this cake super moist. Don’t omit them or replace them with other ingredients. I tried making an eggless pineapple upside down cake but it was awful and had a very weird texture. Make sure not to omit the eggs in this recipe! Chilling the cake in the fridge for an hour will make it easier to slice. Some people like to make upside down pineapple cake with crushed pineapples but I don’t recommend that. It’s just not pretty! You can use this recipe to make pineapple upside down cake for cast iron skillet but be sure to bake in the oven and not the stovetop. Some people like to make pineapple upside down cake with rum sauce. We don’t use alcohol and I have never tried that. Who invented pineapple upside down cake? Where did pineapple upside down cake originate? When was pineapple upside down cake invented? I am not sure about the exact city but based on my research, it originated in Europe around the 1920’s. It was traditionally a skillet cake that was cooked on the stovetop. It gained its popularity for the caramelized fruit bottom that makes a decorative topping, when flipped over. It gained even more popularity in America after canned pineapples were introduced. Pineapple upside down cake fresh vs. canned pineapples? You can use fresh or canned pineapples. I prefer using canned pineapples since they are readily available and already cut into even shaped rings. Pineapple upside down cake light or dark brown sugar? I like to use brown sugar since it makes a more flavorful caramelized top layer. Pineapple upside down cake hot or cold? Traditionally, it’s served cold but I have heard some people enjoy it warm with ice cream. It’s more ooey gooey this way. Does pineapple upside down cake need to be refrigerated? Since fruits are used, yes, this cake should be refrigerated. Also, chilled cakes are easier to slice. How to store pineapple upside down cake? Where to store pineapple upside down cake? How long does pineapple upside down cake last? Once the cake cools down to room temperature, store it in a sealed container in the fridge for up to 3 days. . Do not keep it at room temperature since it has fruits that can go bad. How to freeze pineapple upside down cake? Once the cake cools down completely, cover it in saran wrap and keep it in a freezer bag. Store in the freezer for up to 1 month. What to cook pineapple upside down cake in? I highly recommend using a springform pan since that makes it easy to remove the cake. How to get pineapple upside down cake out of pan? How to flip pineapple upside down cake? Make sure to use a springform pan. Let the cake cool down. Then, gently run a knife around the sides of the cake. Unlock the springform pan and remove the side piece. Finally, flip the cake upside down onto a plate. How to keep pineapple upside down cake from sticking? Make sure to spray your pan properly with oil. What is pineapple upside down cake? It’s a round cake with a caramelized layer of pineapples and maraschino cherries and served upside down. How to make pineapple upside down cake from scratch? 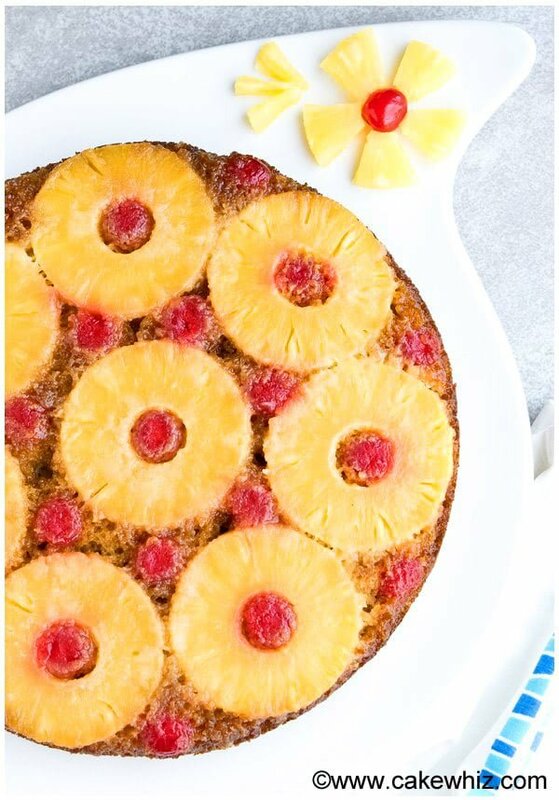 How to make pineapple upside down cake topping? People have different preferences. The classic caramelized topping in my family recipe is made with brown sugar and butter. Pineapple slices and maraschino cherries are used for decoration. How to make pineapple upside down cake without brown sugar? Some people use caramel sauce or corn syrup but I feel like that it makes the cake too soggy. How to make pineapple upside down cake cupcakes? You can use this cake recipe for cupcakes but you would have to use a cupcake pan with no liners. You would have to generously spray the cupcake pan with oil. You would also have to slice the pineapple rings into smaller pieces and arrange them in each cupcake cavity. How to serve pineapple upside down cake? This cake is already so pretty and has so much flavor that it doesn’t need a lot in the end. You can serve with a dollop of whipped cream or even vanilla ice cream. Some people enjoy this pineapple upside down cake with vanilla pudding. I find that combination really WEIRD! lol. I also have a recipe for an easy pineapple upside down cake using cake mix like Duncan Hines and crushed pineapples for crockpot. 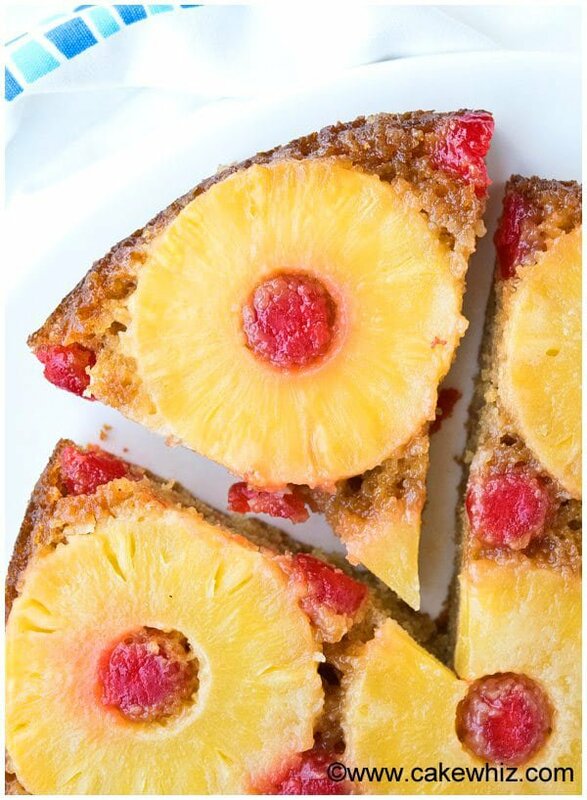 You can even use a sugar free cake mix and fresh pineapples to make pineapple upside down cake for diabetics. 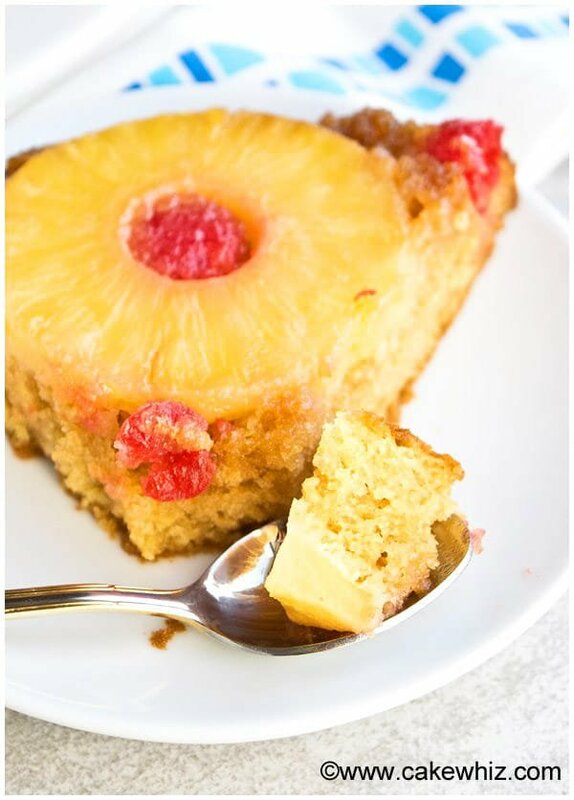 Technically, it’s a pineapple upside down dump cake and I can’t wait to share that with you! 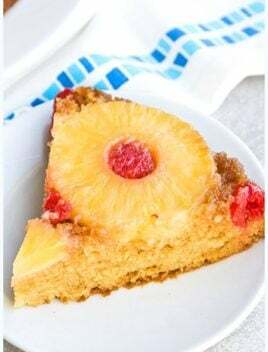 Quick and easy homemade pineapple upside down cake recipe rom scratch. It's soft and moist with a golden caramelized top layer. Best classic cake ever! Place the pineapple slices on a plate lined with a couple of paper towels so as to get rid of excess pineapple juices. Place the cherries on a plate lined with a few paper towels too so as to get rid of excess syrup and juices. Melt butter in the microwave and pour it into your 9 inch springform pan. Use your fingers to spread the butter over the entire pan. Sprinkle brown sugar on top of the butter. Arrange the pineapple slices and maraschino cherries on top of the brown sugar. In a mixing bowl, add egg, yogurt, buttermilk, olive oil, vanilla extract and orange extract and mix everything thoroughly. Add flour, sugar, baking powder, baking soda, salt and mix until just combined. You might see some lumps. Don’t worry about them and don’t over-mix! Gently, pour this batter on top of your arranged pineapple slices. Use the back of a spoon or spatula to spread the batter evenly in the pan. Be very careful not to move the pineapples or cherries. Let this cake cool down to room temperature. Then, remove the springform attachment and flip this cake gently onto your cake stand. Enjoy! - Leftover cake can be stored in a sealed container in the fridge for up to 3 days. What is orange emulsion oil? I would love to make this but I never heard of this ingredient. Please help. It’s a type of flavoring, similar to extracts but since it’s oil based, it doesn’t evaporate during baking and thus, the flavor and aroma is stronger. You can use orange extract, if you like.